MGA has four full-time respiratory therapy faculty and several part-time instructors. 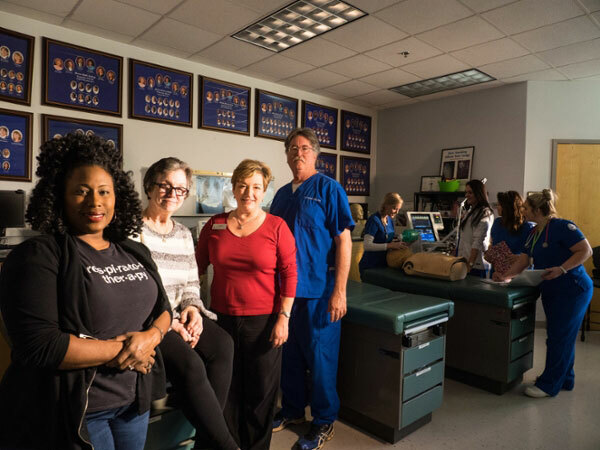 The full-time faculty, shown here in one of the University's clinical labs are, L-R, Jasmine Brown, Beth Brown, Teri Miller, and Dr. Charles Matson. Photo by Jessica Whitley. The respiratory therapy program at Middle Georgia State University is taking an innovative leap forward. Beginning fall 2018, Middle Georgia State (MGA) will offer respiratory therapy as a bachelor's degree only. Students currently in the two-year program, which began in 1994, will be able to finish. But MGA is ending the associate's degree as the University prepares to offer the four-year program. "This is where the profession is going," said Teri Miller, chair of the Respiratory Therapy department. "In fact, the Commission on Accreditation for Respiratory Therapy will not accredit any more new two-year programs. We are taking a necessary step, one that will prepare our respiratory therapy majors for leadership roles after they start their careers." The new degree will be just the fourth traditional baccalaureate respiratory therapy program in Georgia and the only one in the central and southwest part of the state. It will appeal to students who want the traditional university experience of beginning their studies as freshmen and pursuing their intended degrees over the course of four years. MGA will base the degree on the Macon Campus. Miller noted that the University will, for now, continue offering a "bridge" program that allows associate's degree graduates who are already working to complete bachelor's degrees. She said an advisory board made up of healthcare leaders in the region recommended moving toward a traditional four-year degree. The desire of most college-or-university-bound high school students to earn bachelor's degrees was another influence. "Beginning as a freshman creates a smoother path toward a bachelor's degree," Miller said. In January 2016, the American Association for Respiratory Care (AARC) called for a shift toward bachelor's degrees as the profession's entry-level credential. The association noted how the nursing profession has benefited from an emphasis on bachelor's degrees as the gateway into the field. One of the major differences between MGA's associate's and bachelor's degrees in RT is the four-year program's greater emphasis on courses in management and research. The bachelor's program focuses more on developing critical-thinking and problem-solving skills. Also, "students will still take the standard lab and clinical courses, just more of them," Miller said. "Our students will be able to look at patient care more holistically. Since many of our graduates stay in the region to work, this is good news for community members who need respiratory care from healthcare providers in the area." Miller and her colleagues developed the degree over the course of two years. The AARC, where Miller has a leadership role, monitored their efforts so it can help other colleges and universities duplicate the effort. "We're proud of our work," Miller said. "We think potential students interested in respiratory therapy careers are going to be very excited to be part of it." MGA is now recruiting students to join the charter class of those pursuing the Bachelor of Science in Respiratory Therapy. For more information, see www.mga.edu/health-sciences/respiratory-therapy, call 478-471-2783, or send an email to teri.miller@mga.edu. This article originally appeared in the spring 2018 issue of MGA Today magazine.